Yup, it’s my Birthday. So, do you think, I’m one of those “embrace-your-special-day-it’s-so-great people”? Or am I the “pensive-getting-older-stinks” type? I can’t decide…but, either way, there will be champagne. And, possibly cupcakes. Hoping there’s champagne and cupcakes in your weekend plans as well! Have a wonderful birthday weekend. No Chanel cake? Happy happy! I hope there are lots of random Chanel items in your birthday packages! Happy Happy Birthday!!!! Hope it is full of laughter and Chanel! Happy birthday to you! Enjoy celebrating wonderful you! Happy Happy early Birthday to you!!! Happy Birthday, Sue! And if either a cupcake or champagne comes my way this weekend, I'll promise to toast to you! Happy Birthday tomorrow! Celebrate LIFE. I hope it's full of all your favorite things. I´m hoping you´ll have an amazing birthday. Age is just a number…so feel special, it´s your special day of the year! Also wishing you a happy new start! Thanks for your support during the year! Happy (hopefully Chanelish) birthday. I'm going to a girl birthday party tonight for a friend – will send you a little wish as she blows out her candles. Oh Happy anticipated Birthday! I'm sure you'll have great fun! Tomorrow it's my sister's birthday too and she thinks like you! Happy, happy birthday, Sue!!!! Champagne and cupcakes are the best to celebrate all of life's happy moments, but especially a birthday! (That and maybe a new little chanel handbag). I'll be sure to raise my glass to you tomorrow! Happy Birthday!!! I think that cake would be perfect for your party, gorgeous lady!! Cheers for champagne and cupcakes! HAPPY BIRTHDAY! I'd go for the champagne and cupcakes more fun! Hope you have a wonderful birthday weekend! Champagne wishes and cupcake dreams darling! Happy birthday! HAPPY,HAPPY DAY ZHUSH…may it rain Chanel on you! Hopefully the hubby will throw in a "random Chanel" item of his own for you today, along with the champagne and cupcakes and pensive thoughts. What a year it's been for you — bravo Babe. Have a Happy Birthday and remember every day is a special day and we should all celebrate with cupakes and champagne every day! "EMBRACE" it! It's coming whether you like it or not! I turn 40 in August and I've already embraced the idea! You are as young as you feel and age is just a number! Hope you have a wonderful birthday tomorrow and drink loads of champagne, that will help you get through it! Happy birthday! You deserve every single random Chanel item you have ever featured. Have a great one! Happy Birthday! Enjoy every second of it…I'll have a cupcake in your honor. Wishing you a lovely birthday weekend! May it be filled with love, laughter and champagne. Happy Birthday beautiful Sue! 28 was it? Hope you are celebrated royally this weekend. Thinking of you and sending you tons of good energy. Happy, happy, Sue! Champagne and cupcakes sounds just delightful! Happy Birthday! Enjoy your day – with lots of champagne and cupcakes! Happy birthday Sue! I hope you have a fabulous day. Oh go ahead & celebrate!!! Just don't tell anyone how old you are (even if you are 18), make them gasp when you say your 51 !! Happy birthday…wish you a very happy day and much success. Happy Birthday Sue! There are so many delicious cupcakes out there, I say have yourself a little party. And celebrate! I'm sure lots of good things are in store for you this year. Happy Birthday Sue!! Hope you day is wonderful! Definitely a birthday full of "C". Cupcakes, Champagne, Chanel. And they do say things come in 3s, so here's hoping you get all 3! Have a lovely birthday. Greetings from soggy Melbourne, Australia. A January girl so have a wonderful fun Birthday. sue! happy birthday tomorrow!! I tend to hide out when mine roll around. wishing you a day and weekend full of friends, family and fun! 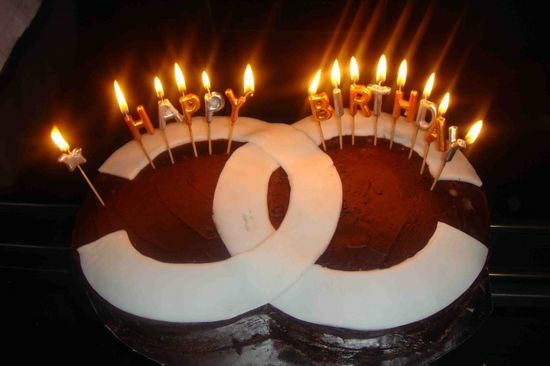 Sending you big interlocking "C" hugs and wishes for a super great day! Happy Birthday!! I hope you have a wonderful day!! Have a fantastic day and here's hoping you pick up a little CC love. Happy birthday! Hope your champagne-filled celebration is a delight.